Parallels announced the immediate availability of Parallels Desktop for the Mac on Thursday, officially bringing the computer virtualization application out of beta. Parallels Desktop lets you run several operating systems, including Windows, Linux, FreeBSD, Solaris, OS/2, eComStation or MS-DOS, at the same time on your Intel-based Mac. It also lets you exchange documents between Windows and Mac OS X. Run Mac OS X and Windows at the same time with Parallels Desktop. 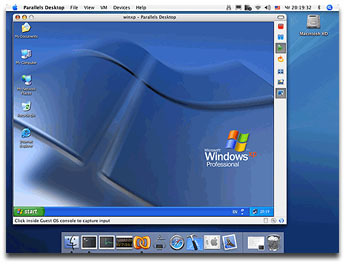 Parallels Desktop includes Parallels Compressor, which reduces the amount of hard drive space required for a Windows 2000, 2003, or XP virtual machine by 50 percent or more. Parallels Desktop for the Mac is available at the Parallels Web site, and is regularly priced at US$79.99, but cost $49.99 for the next 30 days. Parallels Compressor is available as a stand alone product for $179.99.